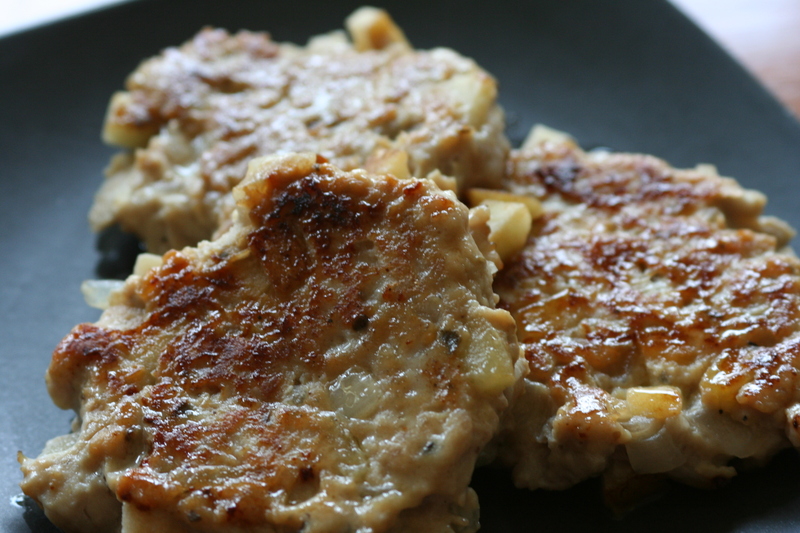 A few months ago I purchased a pound of ground chicken for the purpose of making homemade chicken sausage. But I couldn't get it made in time, so I froze the meat until an opportune time. An opportune time arrived in the form of a long weekend with my husband and I dug out the recipe I'd planned to make. Served alongside some eggs and asparagus, these sausages were delicious. And since you're making them yourself and know all the ingredients included, they are certainly healthier than your average sausage. Heat oil in a large non-stick skillet over medium heat. Add onion and cook, stirring, until beginning to soften, about 2 minutes. Add apples and cook, stirring, 2 more minutes. Transfer to a large bowl and cool for 5 minutes. Wipe out the pan. Add chicken, sage, sugar, fennel (if using), salt and pepper to the bowl with the apples and onions. Gently mix to combine. Generously coat the pan with cooking spray and heat over medium. Using a 1/3-cup measure, scoop 4 portions into the pan, flattening each into a 3-inch patty. Cook until the patties are browned and cooked through, about 3 minutes per side, adjust the heat as necessary to prevent burning. Coat the pan with cooking spray again and repeat with remaining sausage mixture. Sausages come in both link and patty shape and it doesn't change the dish. You could always try shaping them into links, though I think it would be quite a challenge. As far as other meats, the flavor would naturally change some, but feel free to experiment and see what tastes good to you!